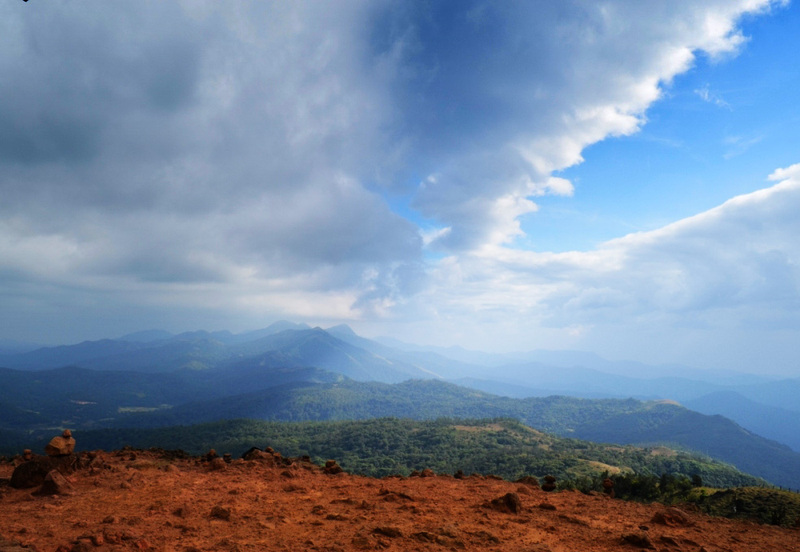 It was the starting of Day one of my Madikeri stay , starting of tour was going to start from the two of the most holy places of western ghat , Talakaveri from where the Kaveri river originates and Bhagmandala where Kaveri river meets two other rivers. Talakaveri was some 2 hrs away from Victorian Verandaz where i was staying and i had the nice company of our driver Mr.Kamal who was going to be our guide as well for the trip. Like i said he was going to be our guide , and he did the best in that , as soon as we were in car he started talking about Talakaveri. Sir, we are going to the point from where Kaveri river originated centuries back , you must have heard of Kaveri river dispute between Karnataka and Tamil Nadu. 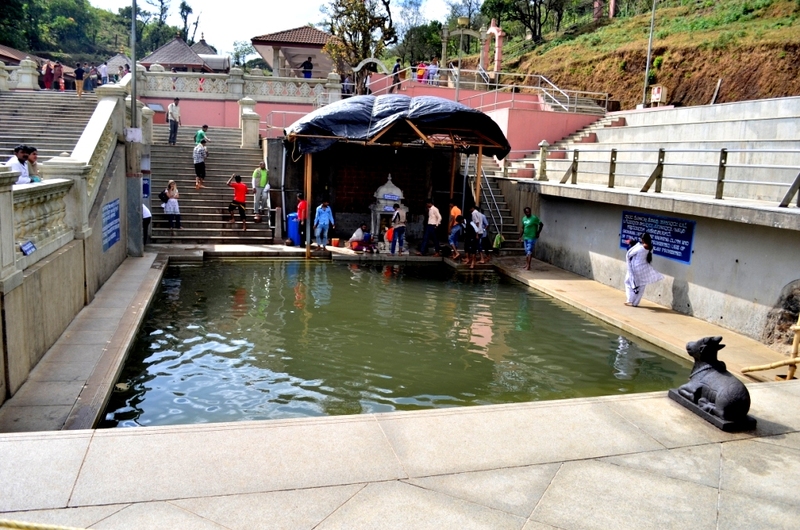 ” Dont know how much you have read about Kaveri river and talakaveri spot, but it is said that it was Lord Brahma’s daughter Vishnumaya to whom Brahma wanted to be on earth for ever and ever and that was the reason he converted his daughter into Kaveri River , so that she could remain here on earth forever and whose water could purify all the sins “. After atleast two hrs we were at Talakaveri pond from where the Kaveri River originates. A small pond , full of water , but nobody knowing from where the water is coming in the pond. 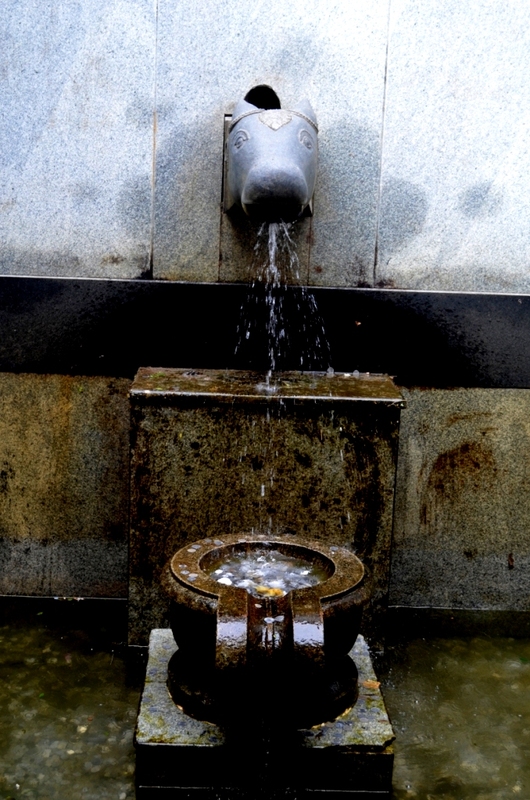 A small idol of Vishnumaya or Goddess Kaveri kept there , people washing there hands and feet first to purify themselves and then reaching to Vishnumaya to take her blessings. On the right was this pond , and on going just one storey down i reached to the spot from where Kaveri River took her path towards the land , taking form of a huge river. 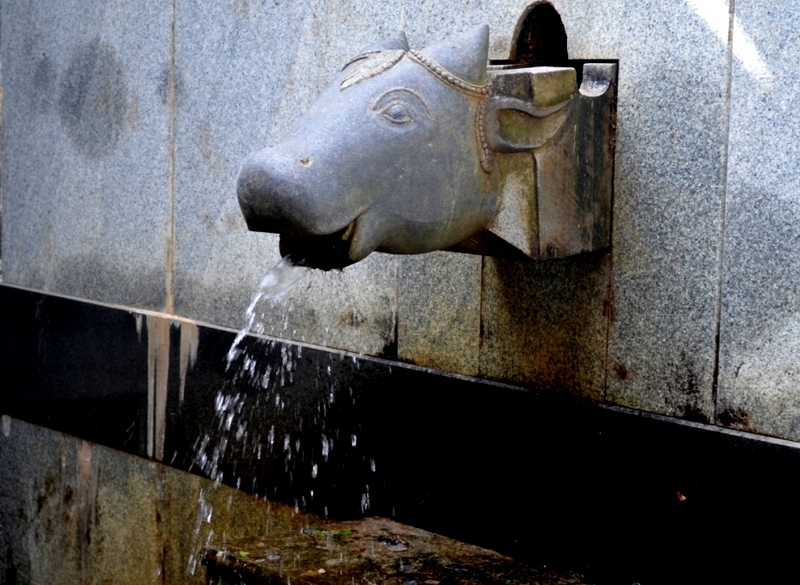 Though i tried to find the spot from where it went ahead , but was unable to locate , may be from there it had entered again into the earth and must have been coming out again from somewhere , but this Mouth of cow designed on the wall is the point from where Kaveri River take her passage to move onwards. My driver had told me ” Once you through with the pond sir , you will find stairs going up , do not miss that spot though you would have to climb atleast 100 something stairs but do climb , and reach to the top and i would waiting for that special thing which you tell me after coming back “. So we obeyed his guidance and started climbing. Things would turn so tough i never knew , a man weighing atleast 90 Kgs going to test his knees again , anybody can guess what he must have gone through. Trust me , i can walk on inclined paths easily or if being too honest aleast less tiring than climbing these stairs. He had told you would have to climb atleast 100 of them , but here he was wrong. I took this pic when i was half way through and i am sure if i start counting stairs in this pic only , they are going to very easily surpass the golden figure of 100. It took hell of time and energy of mine to overcome this hurdle , but atlast i was on the top and a magnificient view was waiting for me. My driver had said , that he would be waiting for something special from me , he didnt gave a single clue and i thought may be it was this view of which he was talking , but it was something else. I have a habit of clicking pictures from both my DSLR and my Iphone , so that i could straight away update the things on my facebook and twitter. Same i did here , took out my Iphone and clicked some pictures. Network was showing full high five , and suddenly one message popped up ” Welcome To kerala ” . I was standing on the border of Kerala and Karnataka , my cell phone had started receiving signals from the tower lying in the territory of Kerala state. 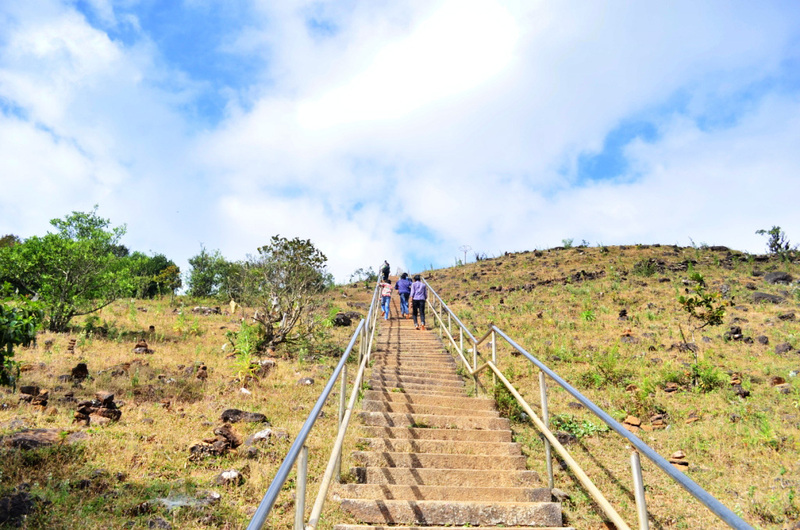 Later on , while coming up i counted stairs , i could give some portion of my concentration to maths also now , previously i was all physical work and now when i was going back its going to consume less energy of mine and i started counting the stairs. On reaching to my car , first word from driver came ” Sir , did you checked your cell phone up there ” , i said yes , i know you are talking of that Welcome To Kerala message , So you got it sir. Then i said to him , “ What you were saying , i would have to climb 100 something stairs , man i counted while coming back and they are atleast 350 stairs till this gate of the temple ” . And in a very stylish style he giggled a bit and said “ Me telling you the exact number was more benificial or you climbing and coming back with some nice pictures in your camera is more benificial , would you have gone if would have told you exact number “. I was smiling and nodding and saying May be i would have. Talakaveri was over , and now we moved back to Bhagamandala which was on the way.